Mike Manley was born in Detroit, Michigan and has been drawing and working in comics and commercial art since he was 15. He has been a working comic book professional since the age of 23. His powerful and expressive drawings, dynamic inks and strong story telling skills, have made him an in-demand artist for some of comic’s top titles for all of the major publishers. In 1982 at the age of 21, Mike was the art Director for the Detroit Metro Times, a weekly city newspaper. In 1984 Mike moved to Philadelphia and started working for Marvel and DC comics. Mike finally landed at Marvel with the popular Transformers comic and quickly moved on to other established characters like Conan, and Spiderman. In 1990 Mike co-created and drew the character Darkhawk for Marvel. Not content to stay in place and in demand, Mike moved back to DC Comics in 1993 and became the regular artist on their most popular character Batman, starting with the 500th issue which sold 2 million copies. Mike drew the book at the height of the character’s popularity. While at DC, Mike added Superman and Shazam to his roster of work. In 1995 Mike formed Action Planet Inc. to publish his own comics and ideas. In 1996 Mike broke into the animation field and joined the staff at Warner Bros., doing storyboards and background designs from his home in Philadelphia on the highly successful Kids WB Superman, Batman and the new smash hit, Batman Beyond animated TV shows. He has also worked on Samurai Jack, Fairly Odd Parents, Batman Brave and Bold, Secret Saturdays, Venture Brothers, Kim possible, Clerks Spawn for HBO and on MTV’s Spy Groove series. In 2001 Mike started his twice Eisner Award nominated Draw! 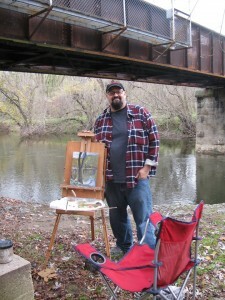 Magazine and teaches storyboarding, drawing and cartooning classes at The University of the Arts and the Pennsylvania Academy of Fine Arts, where he is enrolled and has just completed his 3rd year as a painting major on his way to a MFA. In 2010 Mike became the regular artist on the Judge Parker newspaper comic strip. © 2011 Michael Cole Manley. All images are copyrighted by their respective authors.